Eleven years ago - it isn't a round number for commemoration, but today shares one thing with the original date: Tuesday...which is significant. It's generally a very light air travel day. That and the weather was perfect. So the planes took off with no delays. I had a flight scheduled that morning - 10:30 AM. LaGuardia through Memphis to El Paso, Texas. The car service arrived at 9 AM on schedule. Back then you only had to allow for NYC traffic to get to the airport, not security. But right before I exited Apt #8G of the building pictured above, NY1 had live pictures of smoke billowing from the North Tower of the World Trade Center. They were reporting a plane crash, but the size of the plane or damage wasn't known. It wasn't exactly a ho-hum moment, but at that point there was no guarantee my plane would be grounded. So I went downstairs and hopped in the waiting Lincoln. Business as usual. My Russian driver had one of the AM news channels on, and as we headed east through Harlem we heard that the second tower was hit. I got a call from my Jewish Mom, which was the last incoming or outgoing call that went through on my cell for the next several hours. I told her I was fine and aware of the news she was reporting, but traffic was starting to bottleneck so I had to tend to my immediate situation. The driver was asking me what to do. I had no idea. I called the airline and couldn't connect, so we tried to keep plugging east but the outbound bridge was roadblocked. If we had gotten across 10 minutes earlier, we wouldn't have returned to Manhattan that day. still about my issues, until we turned south and I saw the huge clouds of smoke obscuring the towers which should have been visible about 5-6 miles straight ahead. And then the news radio report came through that the Pentagon had been hit as well. I got home and plopped in front of the TV for several hours (several days really). I had quit smoking cold-turkey about 10 days prior in conjunction with the emergency root canal I had underwent, so I was especially fidgety. Landlines were intermittent for several hours, which of course meant the modem-based internet was skittish as well. So updates from friends and loved ones were trickling in. My friend (and boss on this event) was en route to El Paso when his Chicago-bound plane was diverted to Syracuse. He rented a car there and returned to his family in Connecticut that evening. ABC Sports colleagues of mine were stuck on the ground in Denver after the Monday Night opener. Some of them drove all the way back to New York. I got calls and e-mails from high school friends and ex-girlfriends to see if I was OK. I played phone tag with a woman I had dated recently who worked in one of the WTC satellite buildings. The local news was alerting us that trauma units were looking for blood donations, but by the time I got to the spot in my neighborhood, they were already over-supplied. I changed into some running gear with radio headphones and went to Riverside Park for a run. I thought there wouldn't be anyone out, but a lot of people were just as stir-crazy and had the same idea I had. It was late-afternoon by then and it was still a picture-perfect, gorgeous day. Only problem was you could taste the ashes in the air. The radio news programs were becoming repetitive at that point, as they are designed to be. 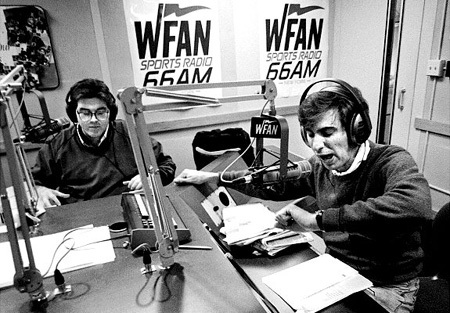 So I switched to Sports Radio 660 WFAN, and Mike And The Mad Dog (Mike Francesa & Chris Russo). They were having an animated discussion, with expert guests and regular callers, which somehow developed into how the attacks centered around the U.S. support of Israel. I remember specifically bits and pieces about the quandary that a religious nation-state presents, but I never found their opinions to be objectionable. They were doing what they always did, taking the story of the moment and spinning it off the cuff. They were true New Yorkers, taking calls from the most passionate New Yorkers, trying to make sense of the greatest tragedy of our lifetime. Granted they were light years away from their area of expertise, but it was the first place where you could hear real people expressing their anger and sadness. A friend of mine had slept on my couch on-and-off for a few nights after his girlfriend kicked him out. He stopped by to pick up his things, and returned to his apartment that evening. The perspective of 9/11 began their reconciliation. They're married with two kids today. My parents met me at a bagel place, one of the few places open that evening. We all walked together since we had no idea which subways were running and which weren't. We collectively shook our heads failing to understand all the senseless killing, but how could we not appreciate still having each other at the end of this day? Baseball returned 6 days later and the New York Mets, clad in their NYPD, NYFD FDNY, and PAPD (Port Authority PD) hats reeled off a bunch of wins in a row, coming up just inches short of the playoffs. The Yankees made a series of heroic comebacks in the 2001 World Series before falling to Arizona. Baseball bonded the New York community and however you feel about it, we still sing God Bless America in the 7th inning to this day. One of the things I noticed in the months following was a lack of interest in individual accomplishments. The Emmy Awards were postponed 2 months. I remember the lack of build-up for the Heisman Trophy, eventually won by Nebraska's Eric Crouch. Anyone recall that? Several months later I was in the elevator in my apartment building with a full German TV crew. One of my neighbors gave birth on September 11, 2001, and they were doing a big documentary. Life went on but it was never the same, not in New York, and not at any airport. Ground Zero became a tourist destination, and I have not visited. I can acknowledge everything that happened there, and also appreciate the detachment of being just outside the zone of something so horrific. As for me, I never made it to El Paso. 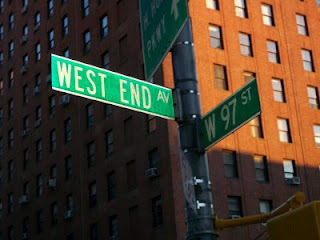 But life has taken plenty of twists and turns in the last eleven years, more than I possibly could have imagined than if I still lived in #8G and that Upper West Side bachelor pad. And there are many days I lose perspective, but not today. Tomorrow on Backtime: the 9/11-related movie that you will never see on broadcast TV again.